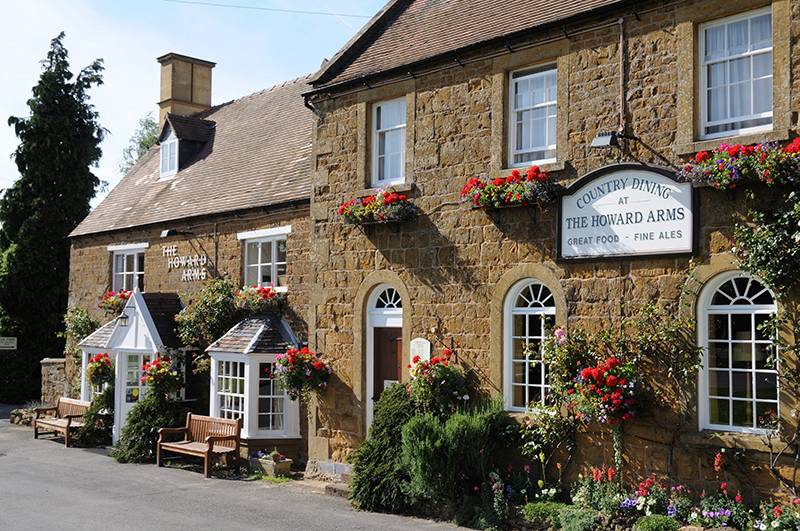 Built during the late 16th century during the same period that Shakespeare wrote King Lear, the Howard Arms in Ilmington is a traditional country pub, restaurant and bed & breakfast. Set on the green right in the centre of this picturesque village in Warwickshire, the quaint building fits perfectly into the heart of the community with its golden yellow stone exterior, window boxes and climbing roses. On arrival you’re immediately welcomed with a warm atmosphere and two comfy leather armchairs sitting in front of a burning log fire. Then around the corner you’ll find a bustling bar filled with locals. 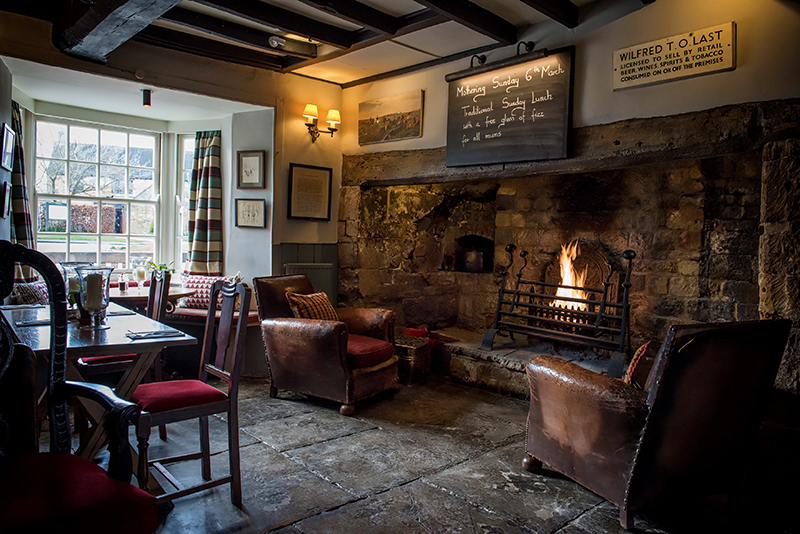 Refurbished in 2015, the 400-year-old Cotswold inn still maintains some of its original fixtures including old beams and flagstones. The antique furniture and interiors give it heaps of period charm. 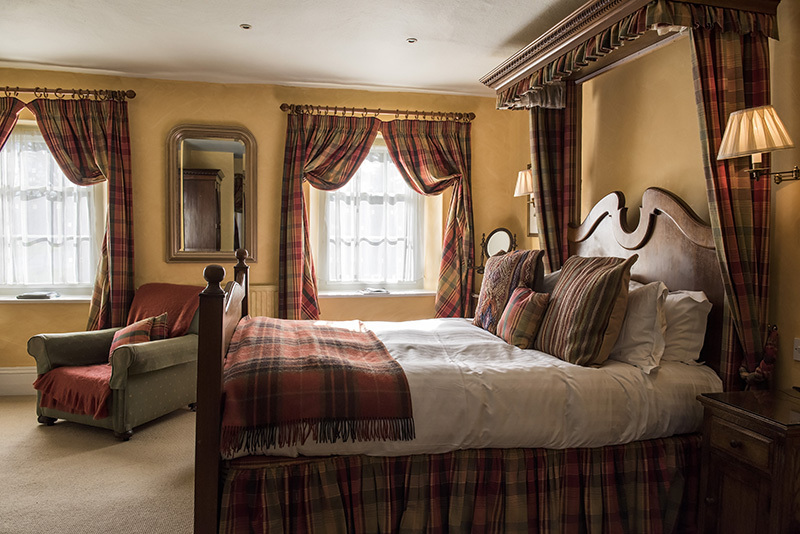 The inn has eight spacious and comfortable rooms, all beautifully furnished, with modern bathrooms and sitting areas. We stayed in the Village Room which is decorated with tartan curtains and Victorian antiques. The personalised gingerbread and oat biscuits with percolator coffee are also a lovely touch to your relaxing stay. AA-Rosette winning head chef Gareth Rufus serves up wholesome pub classics, as well as modern dishes with an inventive take on them. The ham hock rilette with crispy black pudding was splendid, as was the Cropwell Bishop stilton bon bon with grilled pear, pine nuts and port wine dressing. The pork belly with dauphinoise potatoes and pan-fried fillet of stone bass with clam and mussel chowder were both cooked to perfection. The evening meal was rounded off perfectly with delicious sticky toffee pudding and banoffee pie. All in all, tasty pub grub with a fine-dining flair. 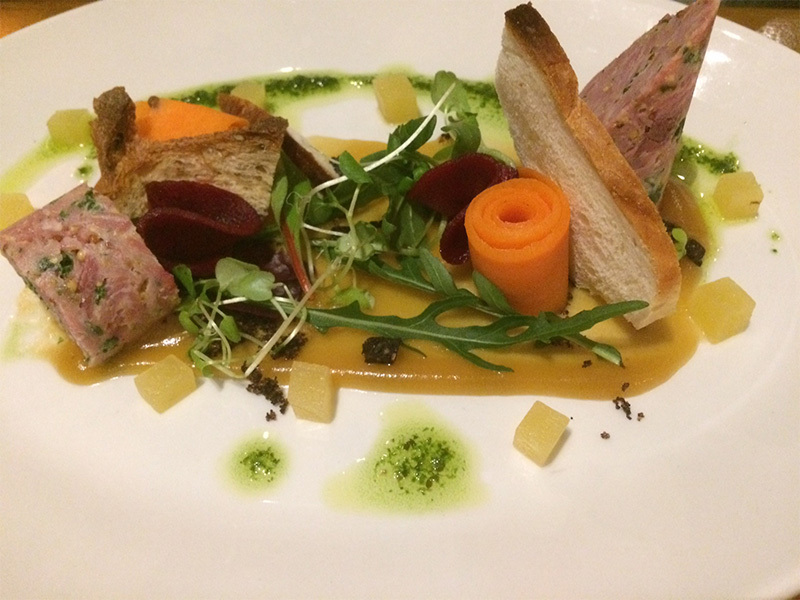 Meals are enjoyed on an inside terrace restaurant overlooking the green through beautiful arched windows or in the summer dine outside in the lovely garden behind the pub. There’s an extensive wine list and casque marque quality real ale, but if you want a local treat try a winter cocktail with Cotswold gin, star anise and cinnamon. The pub also delivers a hearty breakfast including traditional full English and kippers alongside a breakfast buffet of cereals, pastries and freshly squeezed orange juice, all included in the price of your stay. If you’re looking to stay in an idyllic village in the middle of the beautiful Cotswold countryside, Ilmington is ideal. Set in an area of outstanding natural beauty, the peaceful village is made up of olde stone cottages, a village shop and the parish of St Mary the Virgin. Surrounded by rolling green hills, the landscape is a walker’s paradise. Ilmington is perfectly situated for rambles to the nearby Chipping Campden, Broadway and Snowshill, and only eight miles from Stratford-Upon-Avon, the land of the bard. 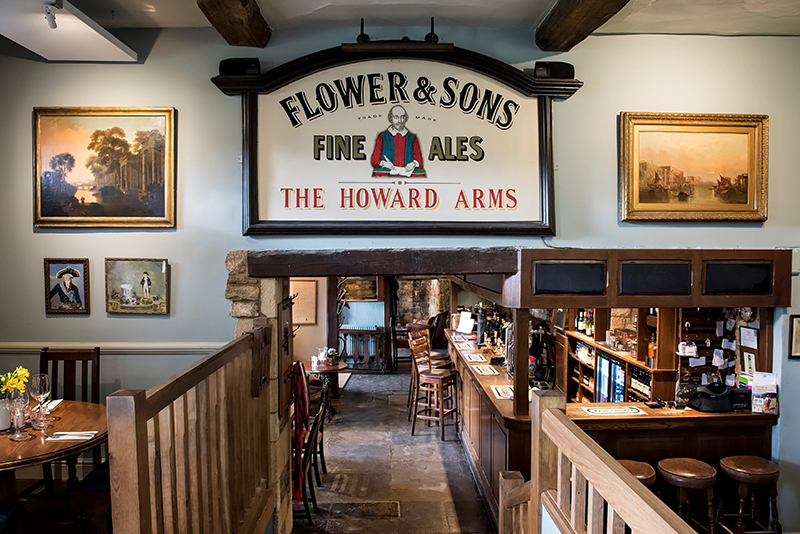 Surrounded by rolling Cotswold hills and close to Shakespeare county, the Howard Arms is perfect for walkers looking to stay in a traditional, cosy country pub with good food and a quiet charm.